A day after Time was sold, there was applause for the magazine's top editor -- and growing anticipation at the other Meredith brands on the block. Meredith Corp announced on Sunday that it is selling the storied news publication to billionaire tech CEO Marc Benioff and his wife, Lynne Benioff, a deal that is expected to close in the next 30 days. As he addressed staff members on Monday morning, Time editor-in-chief Edward Felsenthal trumpeted the sale as a win for the magazine. "[Felsenthal] said this was the best outcome we could have hoped for, and the best part is that they're just as excited as we are," said a reporter who attended the meeting. The reporter said there was palpable relief among the staff, who gave a big round of applause for Felsenthal at the meeting. Meredith bought Time magazine and the rest of Time Inc. last year before announcing that it would sell some of the tiles. The company is still looking to sell three other publications: Fortune, Money and Sports Illustrated. 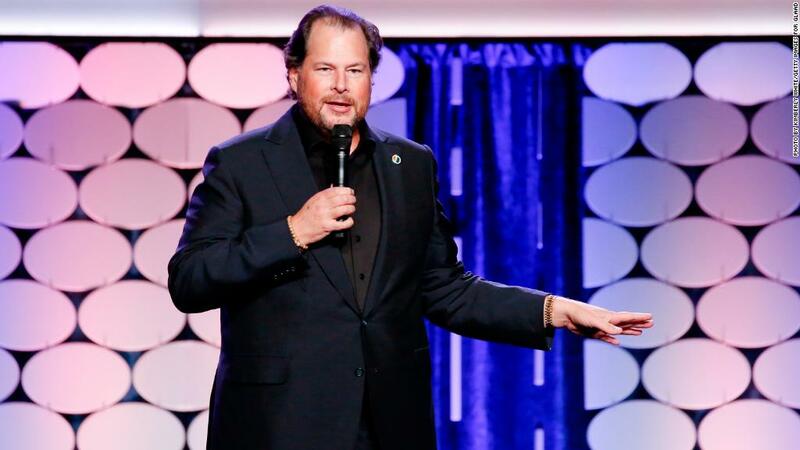 Marc Benioff, the CEO of Salesforce, had long been rumored as a potential buyer of those Meredith titles, which have suffered from declining advertising revenue and circulation in the digital age. Benioff had been previously floated as a buyer for Fortune. Ultimately he went with Time, the most prestigious of all the brands, a move that invariably invites comparisons to Jeff Bezos's acquisition of the Washington Post in 2013. Time no longer holds the public's interest quite like it did in previous eras, but the magazine still frequently drives the national conversation. Its annual Person of the Year issue remains an end-of-year talking point, and the magazine continually grabs headlines with provocative covers. The reporter who attended the meeting on Monday morning said that Felsenthal told staffers that the Benioffs were particularly impressed with Time's covers over the last year, which have included a series of evolving images meant to capture the internal turmoil within the Trump White House. In an interview with the New York Times, Benioff said he decided to buy Time magazine only two weeks ago. When asked why he didn't also buy Fortune, as had been rumored, Benioff said Time "is the best fit for us." "I really liked the Meredith team, and I definitely wanted to do something with them. It just wasn't clear what it was," Benioff told the Times. "When Time emerged as the candidate we all felt it was right. That took nine months to figure out." Now staff members at publications like Fortune, Money and Sports Illustrated are left to play a waiting game; a Meredith spokeswoman said Sunday that deals for those three titles are expected to be announced in the "near future." While there was some disappointment that Benioff is only acquiring Time, news of the deal was greeted mostly with optimism at some of the remaining Meredith titles, according to a pair of staff members who work there. "It's an outcome that any of the titles would want," said a newsroom employee at Fortune. "Who doesn't want a billionaire to waltz in and really take stewardship of the brand?" The employee said that staff members were also encouraged by the $190 million price tag, perhaps a sign that the remaining titles could fetch a similar figure. Meredith has reportedly drawn interest in the titles from dozens of potential buyers; the company was said to be eying $150 million for Sports Illustrated, the New York Post reported in April. The Post reported at the time that Meredith hoped to get more than $100 million for Time, Fortune and Money. Whoever emerges as the buyer, the remaining staff members are just eager for clarity. "I think most of the editorial staff has long believed that a sale would be in our best interest," an editor for Sports Illustrated said, adding that the mood there is "genuinely pretty optimistic." "Not fun playing the waiting game, but we've been pretty much operating business as usual." The employee at Fortune echoed those sentiments. "I think there's been a little relief that there's some movement," the employee said of the Time deal. "We're ready to get out of here."